Robinson Book Store marketed these souvenir postcards around 1920 to commemorate the Great War and Golden’s Liberty Bell. Golden’s fire alarm bell cracked on November 11, 1918. It broke after five hours of continuous ringing to celebrate the signing of an Armistice, which put an end to the fighting of World War I. The matter of replacing the Central Fire Station fire bell was resolved in December 1918. Some of the City’s aldermen (basically city council members) felt the bell might be repaired by welding and be as good as new. Ultimately, it was decided that the old broken bell should be preserved as a memorial and a new one purchased. By mid-December of that year, the City Clerk Curry ordered a new bell from the Julius Pearse Fire Department Supply Company of Denver. The bell shipped from Kansas City with an estimated arrival before Christmas. By the end of January 1919, the new bell still was not here. Lost-One perfectly good firebell, weighing about 500 pounds, and 36 inches in width. Was last seen leaving Kansas City. The Golden city council will appreciate any information leading to the recovery of the bell. 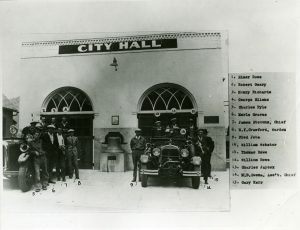 Central Fire Station and Golden City Hall on 12th Street, about 1920. The Golden Liberty Bell is visible between the fire trucks. After making do without an alarm bell for over two months, the new bell finally arrived in early February without explanation. 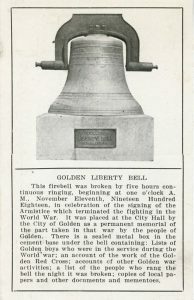 It was quickly installed on the bell tower at the Central Fire Station, and the old, cracked bell – renamed the Golden Liberty Bell- was dedicated as a permanent memorial to the war by the people of Golden. The same bell currently rests outside of Golden City Hall at 911 10th Street.